A Palestinian man mourns at a hospital morgue after his relative was killed in an Israeli demolition of a Gaza tunnel on 30 October. At least seven Palestinian fighters were killed when Israel detonated a tunnel along its boundary with Gaza on Monday afternoon. Rescue teams were still attempting to recover persons missing in the detonation late Monday. A commander with the armed wing of Islamic Jihad, a Palestinian resistance group, and his deputy were among those killed. Five of those killed belonged to Islamic Jihad’s armed wing and two were reportedly fighters with Hamas who had come to their rescue. At least a dozen others were reportedly injured. The spokesperson said that the army didn’t believe that the tunnel posed any danger but decided to destroy it as a preemptive move. Destroying tunnels was the stated goal of Israel’s ground invasion during the 2014 assault on Gaza. Palestinian resistance groups in Gaza – an unequal match for one of the world’s most powerful armies – have used tunnels to strike outsized and embarrassing blows against the Israeli military. Hamas has observed and enforced a ceasefire with Israel since the conclusion of Israel’s 51 days of bombardment in summer 2014. Many Palestinians, including the Hamas party, saw the Monday attack as an attempt to undermine the national reconciliation agreement signed by Hamas in Gaza and the Palestinian Authority in the West Bank earlier this month. Arafat Abu Murshid, the Islamic Jihad commander killed in the Monday strike, is the brother of Muhammad Abu Murshid, also a commander with the group, who was assassinated by Israel in 2007. Hasan Abu Hassanein, an Islamic Jihad deputy commander, had survived several Israeli assassination attempts before his death on Monday, and was reported to have fired the first rocket towards Tel Aviv during the summer 2014 fighting. Islamic Jihad fighter Ahmad Abu Aramana, 25, was reported to have been killed two hours before his wife delivered their child at the same hospital where Aramana’s body was received on Monday. The newborn boy was named after his father. Husam Jihad al-Samiri, an Islamic Jihad fighter, died as well. The health ministry in Gaza said that those who were killed and injured in the tunnel bombing had inhaled poisonous gas and called for concerned authorities to reveal the weaponry used in the explosion. Benjamin Netanyahu, Israel’s prime minister, said that “groundbreaking technology” had contributed to the tunnel’s discovery. Israel has been building an underground wall along its boundary with Gaza at a cost of $1.1 billion. The United States has funded Israel’s efforts to develop tunnel detection technologies, using Gaza as a laboratory, in the hope that they can later be deployed along the US-Mexico border. Israel meanwhile has threatened residents of Beit Lahiya, a town in northern Gaza, saying that it discovered two tunnels and related infrastructure under a mosque and apartment building. The military made a post on Facebook saying that the lives of civilians living in and around the area were at risk of a potential Israeli strike. Eyal Zamir, an Israeli military commander, warned that the apartment building could be viewed as a legitimate target. Adalah and Al-Mezan said that some of the residents of the threatened building have fled but others have stayed because they cannot afford alternative housing. Meanwhile UNRWA, the United Nations agency for Palestine refugees, reported on Saturday that it had discovered a tunnel underneath one of its Gaza schools on 15 October. 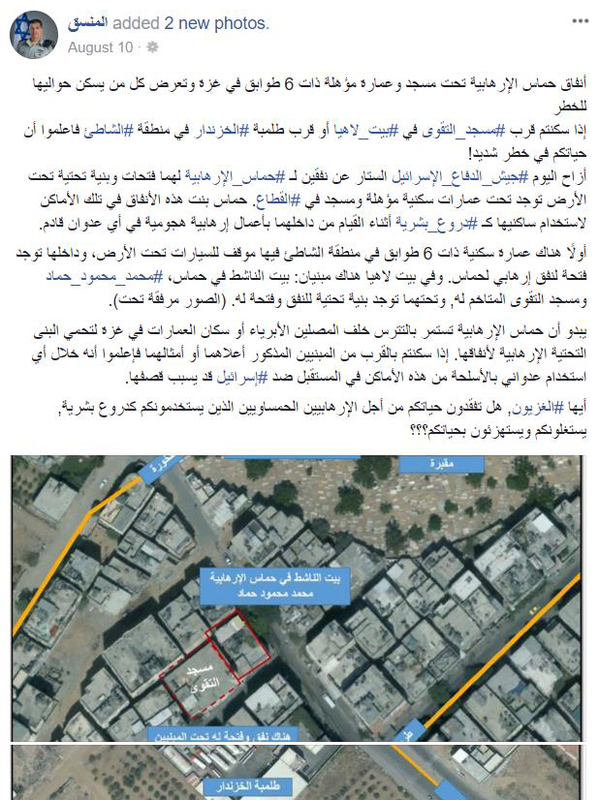 The agency sealed the tunnel and school business resumed 10 days later, UNRWA stated. “The presence of a tunnel underneath an UNRWA installation, which enjoys inviolability under international law, is unacceptable,” the agency said.